Tuesday February 12th 1902 It was colder again today. I was busy with the work all the forenoon and sewed in the afternoon on night gowns for myself, knit and read in evening. 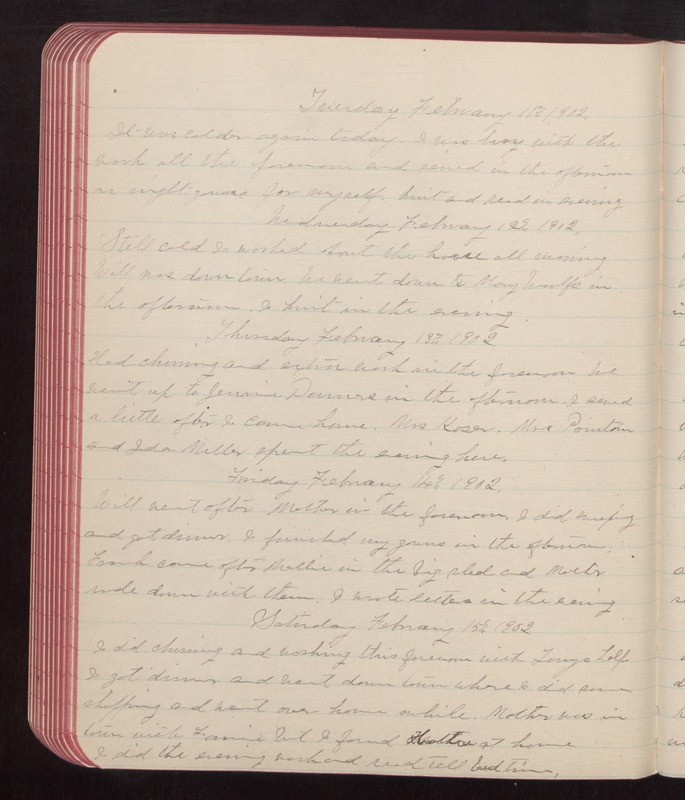 Wednesday February 12th 1902 Still cold I worked about the house all morning. Will was down town. We went down to Mary Woolfs in the afternoon. I knit in the evening. Thursday February 13th 1902 Had churning and extra work in the forenoon. We went up to Jennie Danners in the afternoon. I sewed a little after I came home. Mrs Koser, Mrs Pointon, andf Ida Miller spent the evening here. Friday February 14th 1902 Will went after Mother in the forenoon. I did sweeping and got dinner. I finished my gowns in the afternoon. Frank came after Mollie in the big sled and Mother rode down with them. I wrote letters in the evening. Saturday February 15th 1902 I did churning and washing this forenoon with Terrys help. I got dinner and went down town where I did some shopping and went over home awhile. Mother was in town with Fannie but I found Hattie at home. I did the evening work and read till bed time.